Often misquoted, Shakespeare's Hamlet, Act III, scene II quotation: "The lady doth protest too much, methinks" is also commonly misinterpreted, just as it will be misinterpreted here. Make no mistake, we are not calling Richards a "lady," but he is becoming more and more inclined to whine a bit when things don't seem to go his way. 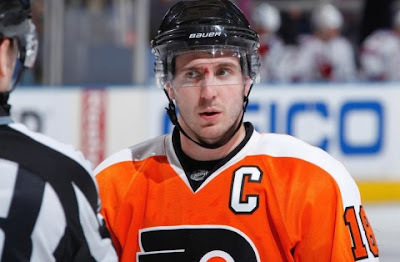 When the wheels were falling off the wagon, after a rough start to last season, we came to his defense, as Chris Pronger and GM Paul Holmgren seemed all to willing to throw Mike Richards under the bus, undermining his status as team captain. Despite this, we expect that what we have to say here will not be popular sentiment amongst Flyers fans. Although he is rightfully lauded for his rugged style and two-way capabilities, Richards has too often used the media to air his grievances to not be considered a bona fide complainer. Neither specious nor counterfeit, he's become a genuine whiner. Want evidence? We got it. Following a loss to Pittsburgh on October 16th this season, Richards in a post-game interview began by praising the Penguins talent before moving on to criticize Matt Cooke's unwillingness to fight. Stop the tape there and you have a legit set of comments. "Well it's tough when you play Pittsburgh. You know that they are going to be falling down pretty easy... I mean you gotta watch your stick. My stick was in there, and maybe I did go at him a little aggressive... but he did fall pretty easy so, it's tough." Had Philly won the game, his comments, in context of the rivalry between the two teams, would have served as acceptable, appropriately inflammatory banter. Yet because of the loss, it's just excuse making. Richards seemed to acknowledge that he was crossing that line and smartly ended the interview. "He's come in the league and hasn't earned respect. It's just frustrating to see a young guy like that come in here and so much as think that he's better than a lot of people. You have to earn respect in this League. It takes a lot. You can't just come in here as a rookie and play like that. It's not the way to get respect from other players around the league and hopefully someone on their team addresses it, because I'm not saying I'm going to do it but something might happen to him of he continues to be that cocky." Richards comments may not seem out of line really until you notice he was speaking after a 3-0 shutout loss to Subban's Canadiens. A pattern seems to have emerged here.
" 'They're getting away with murder out there,' Flyers captain Mike Richards said. 'And we got called every time [Dan Carcillo] was on the ice. It's frustrating, but we've got to battle through it. It's a physical series.' 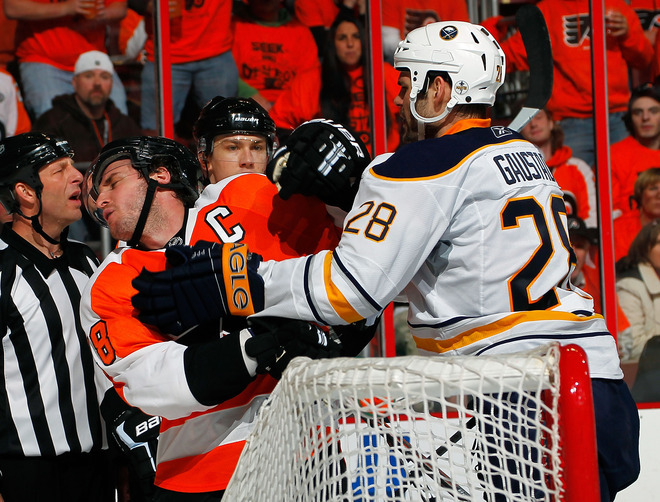 "
"Richards was called for a stunning five-minute penalty for elbowing Patrick Kaleta at the end of the second period. It was a bang-bang play. Richards was pinned along the boards near the Flyers' bench and Kaleta was coming toward him. Richards wheeled with his elbow up, hit Kaleta in the head, and dropped the scrappy forward to the ice..."
" 'I saw him take a couple of hard strides at me," Richards said. "I had to protect myself. They're not going to call anything, so I had to protect myself.' "
Really Mike? Murder? Every time? They aren't going to call anything, so it was up to you? The Flyers lost another game, therefore some other factor than the fact that they scored less goals that their opponents was a major contributing factor. Forget the refs, listening to these complaints is frustrating. We are not saying that Richards doesn't take responsibility, or that he whines all the time... just that he does it too much. When you win, you can complain and "protest" all you like, but wait... you won't need to.